This magical bohemian getaway pairs thrift store furnishings with luxe dining, soothing spa services and some seriously romantic views of the Hollywood Hills. 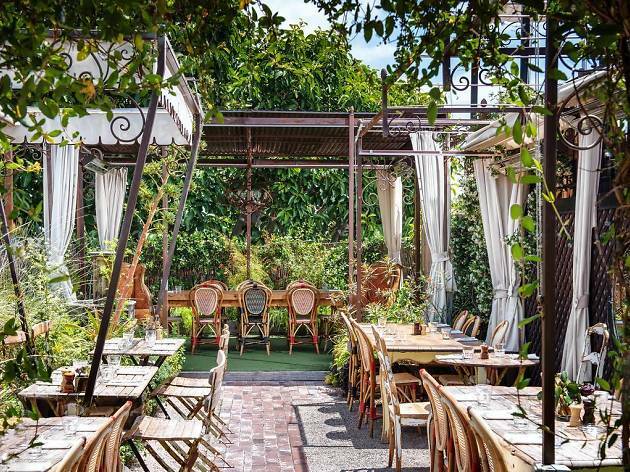 If L.A.’s vibe is “rich hippie,” then Petit Ermitage is a mecca for boho pilgrims everywhere—and we mean that in a good way. A hodgepodge of mismatched furniture, antiques and folk art adorn the lobby, giving it the feel of an eccentric aunt’s Topanga Canyon hideaway. Bedrooms are adorned with colorful carpeting, hand-carved wood details and private fireplaces. As for activities, the 70s-inspired haunt offers yoga classes alongside a small gym, though the front desk staff will encourage you to forgo the dumbbells in favor of a hike in the nearby hills. While the hotel’s West Hollywood location is a solid thirty minutes from the sea (sans traffic, that is), Petit Ermitage offers the next best thing in its saltwater rooftop pool. Slightly more modern than the hotel’s shabby-chic interiors, the pool deck sports creamsicle-colored striped chaise lounges and, nearby, a grassy rooftop garden. 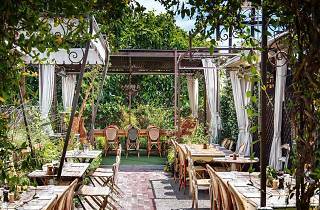 Petit Ermitage’s restaurant comprises of unabashedly romantic candlelit nooks and carefully crafted, hearty-but- healthy California cuisine; for a true Angelino experience, go for brunch and partake in quinoa pancakes or a macrobiotic grain bowl. Location: Situated in the heart of L.A.’s historic gay and lesbian neighborhood, Petit Ermitage is two blocks from the main drag of Santa Monica Boulevard, where you’ll find cafes and boutiques among the bigger bars and clubs. The hotel is also a stone’s throw from the luxe and lively Sunset Strip and Beverly Hills neighborhoods. Abbey: This slightly goth gay clubs boasts four bars, supremely strong drinks and a solid selection of dance music that’s landed it on Best Of lists worldwide. Sushi Park: Arguably the most local spot on the Sunset Strip, this traditional sushi house proudly denounces takeout, tempura and all rolls in favor of classic sashimi and nigiri. Opt for the omakase—yes, it’s pricey, but sushi happens to be one of those you-get- what-you- pay-for cuisines, and Sushi Park’s is exquisitely crafted. The Roxy: Lean into Ermitage’s bohemian rock star vibes at this landmark Sunset Strip music venue. The space is intimate, but the programming is overseen by the same bookers who handle Coachella, so you know you’re in for quality acts. The Church Key: A seemingly endless stream of dim sum-inspired carts glide through this spacious mess hall, carrying international treats like edamame hummus and crispy pork belly. At brunch, invest in bottomless mimosas, or round out your meal with a delightfully boozy alcohol-infused ice pop. Good for: Intimate rooms, stunning views, candlelit dinners and plenty of tchotkes to spark conversation make Petit Ermitage a supreme place to take your significant other for a romantic weekend. Book now, send us a wedding invite later. Time Out tip: Wake up early to check out the Rooftop Lounge in all its quiet glory; not only does the deck offer a 360-degree view of the Hollywood Hills, but it’s also a National Wildlife Federation-approved butterfly and hummingbird sanctuary, and there’s plenty of fairytale wildlife to take in before the crowds arrive.